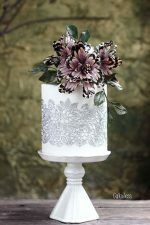 3 beautiful designs with lots of textures using easy modelling paste and sugar peonies and leaves plus full recipes and how to make the paste. 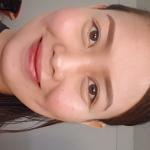 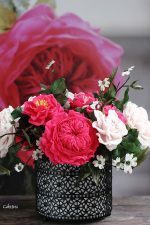 You will start by getting to know about the modeling paste then learning how to make 3 macrames designs: a full pattern, a V-shape pattern and a diagonal design. 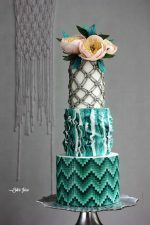 With the same medium, you will learn to create chevron patterns in ombre shades of teal for the bottom tier. 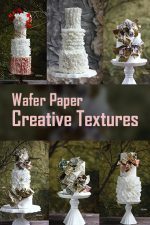 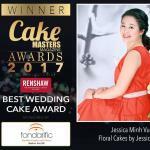 Jessica will also explain about different versions of crackled effects for organic panels to apply on a cake and beautiful ruffles. 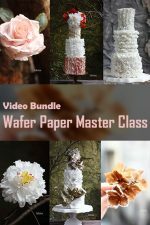 Last but not least, she will show you interesting techniques to make open peonies with cupped petals in pastel peach as well as single peony leaves to go with. 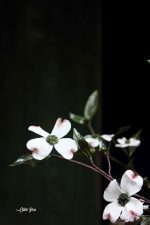 There is a separate lesson guiding you to make the components of the amazing modeling paste that has a lot of applications in Jessica’s signature designs.